Key performance indicators (KPIs) are one of the best ways to tell if things are movin’ and groovin’ in business. Lately, my KPIs have signaled some strong forward momentum, and because of that, I’ve adopted a bit of a take-on-the-world attitude. I hope you have too. This attitude helps keep your nose to the grindstone and powering ahead toward GROWTH. It’s the attitude that makes you productive, but more importantly, keeps your team productive and steered in the right direction. One of the best ways I’ve learned to encourage my team to embrace this momentum is by displaying our data in a visually appealing way. Specifically, I use a marketing dashboard to offer a quick report card of what’s happening in our company. It might sound a little silly but it’s powerful—and I mean powerful! Almost every day, I sit down and look at my marketing dashboard. Some days I’m happier with what I see than others, but regardless of what pops up, I appreciate the ability to get a quick overview of where we are in the business. A marketing dashboard keeps me accountable, keeps my opinions out of the mix, and keeps my team aligned with our overall goals—large and small. 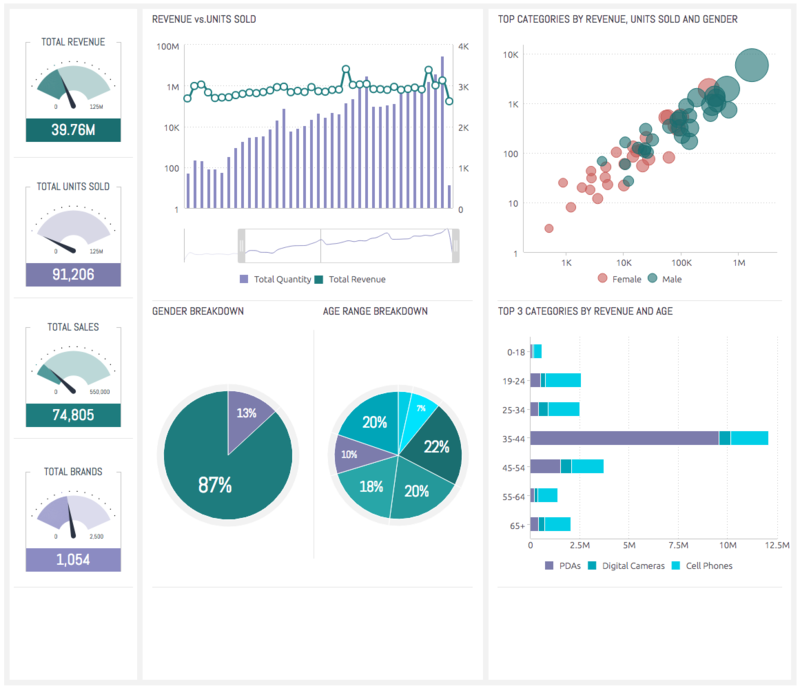 A dashboard goes way beyond the typical spreadsheet full of confusing columns and rows too. It’s one of the best tools I’ve found to becoming more productive, growth-oriented, and a good manager. This isn’t your average too-good-to-be-true tale of yet another marketing tool. There’s a lot of meat here and it starts with understand your KPIs. This is part 3 of a 3-part series. In part 1, I dug into what KPIs are and are not, as well as how to build a KPI system specific for your industry. In the second part, I looked more specifically at some of the KPIs you should be tracking for your initiatives. Now, in this post, I break down how to bring those KPIs together on a beautiful dashboard and use them to help your business surge ahead toward your North Star metric. Ready? Let’s dig in. This is exciting stuff. 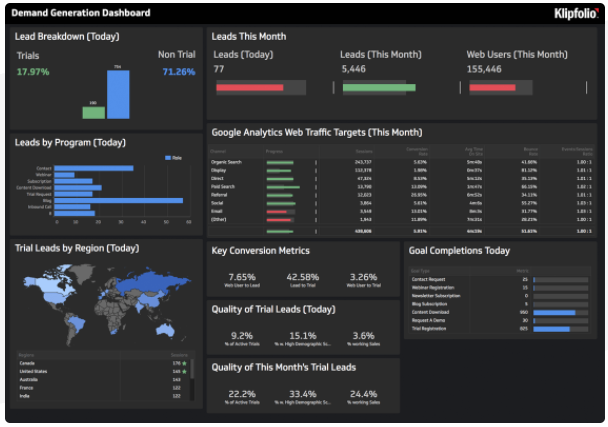 What is a Marketing Dashboard Anyway? 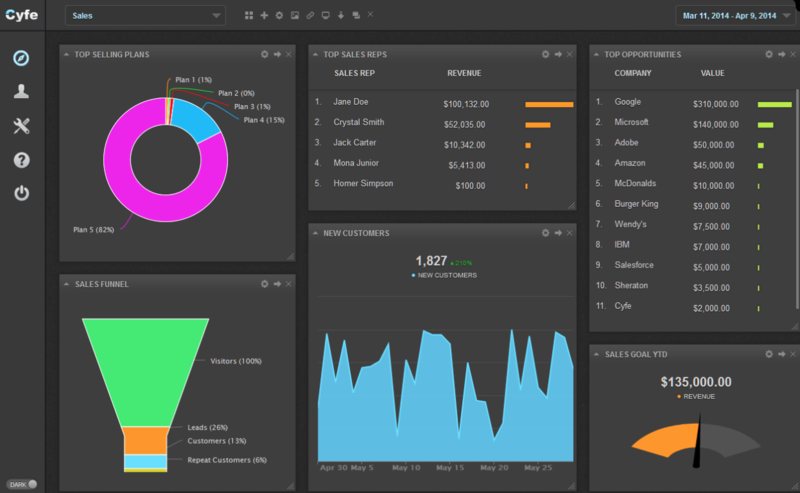 A marketing dashboard is a way to visualize your marketing KPIs in one place. It accomplishes a fundamental, but complex goal: helping you understand the stream of data pouring into your business every day. With a marketing dashboard, you’re better equipped to find trends you might not have seen before, understand your customer’s experience (CX) on a more impactful level, and develop deeper insight into your audience’s actions. These are just meant to whet your palette a little. I’ll show you more and dig into the details a little later in this post. What’s fascinating is that even within your industry, your dashboard won’t look like anyone else’s because the data you’re going to track will differ based on your company’s specific KPIs, North Star metric, and other factors. I’ll also get more into that later, but for now, let’s get back to the main question: What is a marketing dashboard and why do you need one? 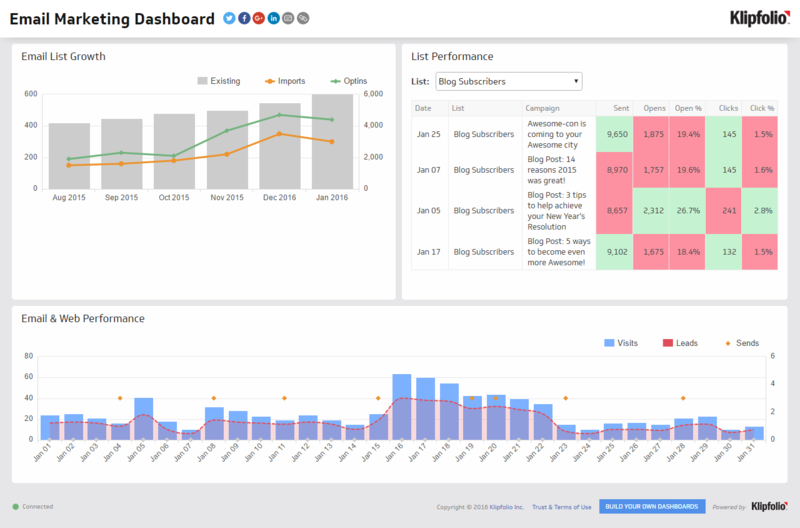 In its simplest definition, a marketing dashboard is a hub where you can view the metrics you need to make growth decisions and understand how well you’re progressing toward your goals. The dashboard is a place to pull all of that critical data together so you can make faster, better, growth-driven decisions. The benefits of having a marketing dashboard go beyond helping you, as a leader, see your data at a glance. By visualizing your business’s data, you align your team and enable them to understand what’s happening in your organization. Through this dashboard, your key players can see, at a glance, what specifically is fueling your overall growth. This alignment is crucial. Giving your team access to your data helps keep them engaged, vested, and making decisions that’ll keep you on track with your North Star metric. The alignment extends beyond the key players in your organization too. By having a dashboard to share with executives and leaders, decisions become more cohesive across all departments. You’re not stuck making decisions in silos but rather in conjunction with other teams who also have growth in mind. For example, sales teams aren’t deciding on new tactics without first understanding the buyer’s journey. Development teams aren’t creating new solutions for your product without first understanding what the audience demands from your business. 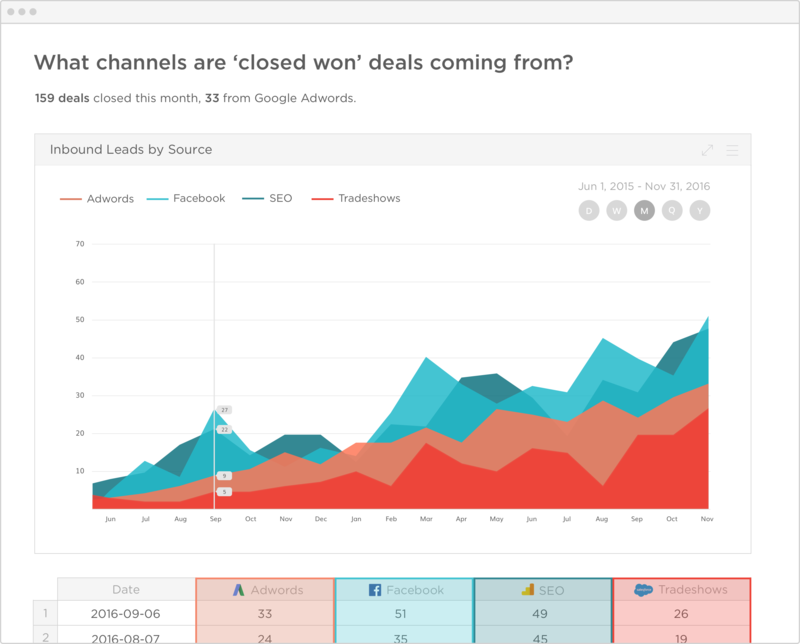 With a marketing dashboard, you are better able to communicate what’s happening company-wide. Gathering big data isn’t enough. Gathering quantitative data is easy. There are more than enough tools out there to pull together statistics and information about what’s going on in your business. It’s the process of taking the big data, analyzing it, and coupling it with other data to pull out actionable, growth-driven insights that’s critical. Having a centralized place to check-in and get real-time updates on your progress toward your KPIs will help you make more data-centric decisions. It will also help you keep your North Star metric as the beacon to guide every decision made in your business. But I can hear your concern now: Each example seems so different, how do I know what’s right for my organization? And, with so many data rolling in every day, how do I know what to track and how to glean actionable insights from this dashboard? I will answer these questions in detail a little further in this post, but first, let me guide you on the main points of importance. What are you trying to accomplish with this data? The best marketing dashboards I’ve seen are ones that focus on providing strategic support for specific areas. In doing so, you can justify your allocation of budget and see which parts of your organization are driving the biggest sources of growth (development, marketing, etc.). Sure, much of this will focus on your marketing plan, but a good marketing dashboard also loops in enough data to get deeper into your firm’s growth patterns. To do this, you need to have gone through the process to aggregate, mine, model, and map your data before you can visualize it in a way that provides actionable insights and helps you find those patterns. Those are steps that are usually tackled by a Data as a Service company or the data team within your organization. But before they can get moving on it, they need to know what you’re trying to accomplish. What are your goals? What are you hoping to achieve by visualizing your data on a marketing dashboard? Who will view this data? 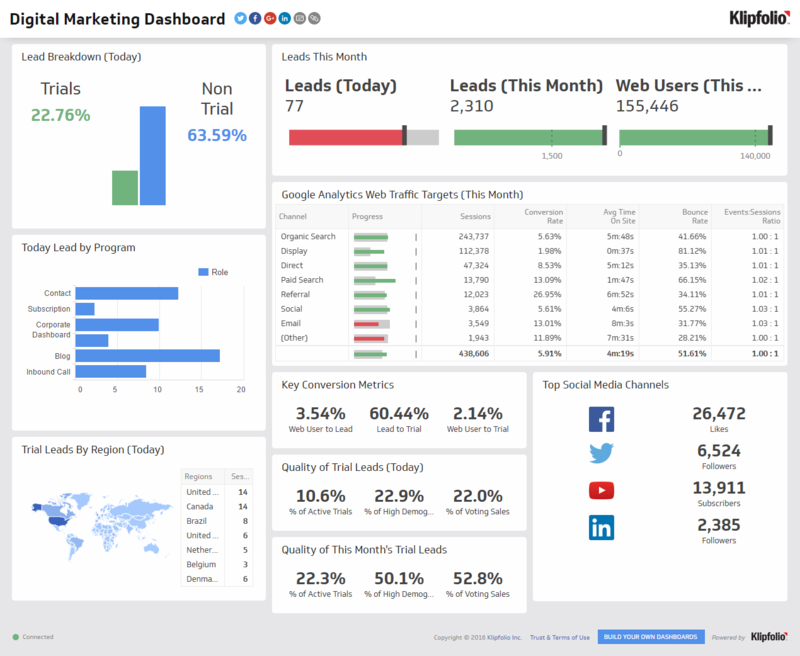 A marketing dashboard isn’t used exclusively by a marketing team. Remember, a modern marketing team aligns the CIO, CTO, and CMO, as well as the legal department, developers, strategists, and others, so you’ll need to take your audience into consideration. I’m not talking about your marketing audience. I’m talking about the internal audience—the ones who will consume the information on your dashboard on a regular basis. These are the people who need to understand what’s happening with your marketing department and how it affects their roles and teams. Displaying the right data to answer their questions will quickly bring everyone together to speak the same language when making crucial business decisions. How will your audience engage with your data? 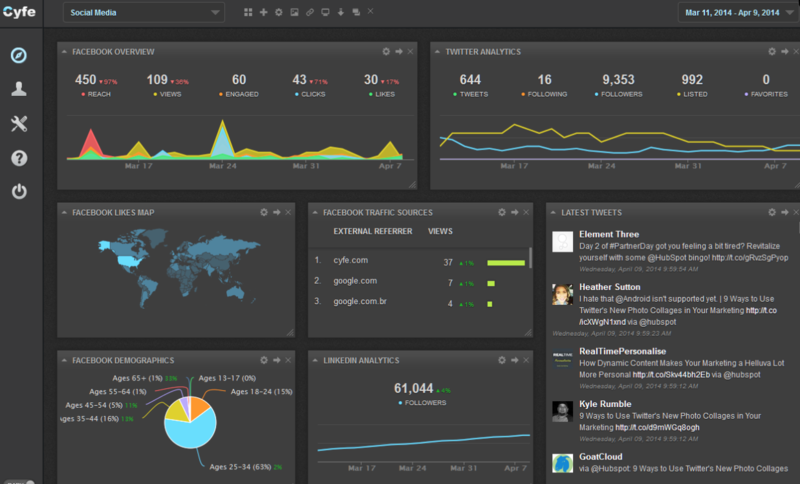 Strategic dashboard homepage. This is where you present key macro information. This information is meant to let you see at a glance whether your performance aligns with your overall strategy. It should also let the viewer dig deeper to get into the granular details, if required. Tactical dashboards. These show how individual tactics are performing. How are each of your tactics supporting your growth strategy? Display data that answers this question, so you can see which tactics are working to benefit your overall performance. Operational dashboard. Some departments will require more detail about specific operations in your company. Where and when the dashboards will be used? I’m a firm believer that visual data should be consumed on a regular basis throughout your organization, but the reality is some leaders won’t tap into that data as regularly as you might. By understanding where and when the dashboards will be viewed, you can build your dashboards to accommodate specific needs. For example, if your operational dashboard will be brought to the board each month, it’ll need to be printed. On the other hand, your development team might need to tap into the dashboard every day to check on consumer behaviors that will shape the direction they’re taking your products and services. Why are you tracking the data you’re tracking? Are you tracking vanity metrics that won’t do anything to fuel your growth in the long run? Or are you tracking sanity metrics—the ones that have a direct tie-in to your overall growth success? It’s tempting to get caught up in numbers of subscribers, fans, and followers, but those numbers don’t paint an accurate picture. By getting choosier and deeper with the metrics you add to your dashboard, you’ll have a better idea of what’s really fueling your growth. Data visualization takes human instinct out of the equation and clarifies what’s actually happening in your business. Too often, businesses rely on human instinct to guide their decision-making. For example, if you see a low click-through rate on an email, you’re inclined to rewrite and restructure that funnel to get more engagement. Although that might not be the wrong move, it also might not be the only move you can take to boost growth in your organization. Be relentlessly fact-focused. Basing all of your growth decisions on facts takes your opinion and human reaction out of the mix and redirects the decision-making to focus on KPIs instead. Be relentlessly focused on customer experience (CX). Your growth depends on enhancing and maximizing the customer’s experience. By focusing on your audience, what’s most meaningful to them, and the end-to-end journey they go through to become your loyal customers, you’ll have deeper insight into what’s happening from start to finish in your marketing funnel. Be relentless in cutting out options. There are at least a thousand ways you can present a product or service (or both). So many, in fact, that it gets tempting to present everything to everyone in the hopes that each person will find exactly what they need. But humans don’t work that way. By making tweaks and adjustments to your customer’s path-to-purchase, you eliminate the temptation to add complexity to your offerings. Think of it this way: Each piece of data is a lever ready for you to push or pull. This data works together to make your growth machine run smoothly and efficiently. When you combine data in a marketing dashboard where you can quickly view, analyze, and act upon the facts pouring into your organization in real time, you set yourself up to make better, more fact-based decisions. I’m passionate about data visualization because it enables you and your team to see the bigger picture. Without this bird’s eye view, growth becomes so much slower and exponentially more difficult. Sold yet? I thought so! This is exciting stuff for any growth nerd out there, but as you start to see it come together in your mind for your organization, I’m willing to bet it’s exciting for you too. Having a data-driven setup is an excellent way for you to keep the bow of your organization’s ship pointed straight at your North Star metric and create a bigger wake as you power towards it. It’s also a great way to stay on track to improving your firm’s KPIs. This high-speed forward movement is important to remember as you start creating the right marketing dashboards for your business. When figuring out how to develop the right dashboards for your organization, the first step is to have clearly-defined KPIs. I’ve covered the importance of KPIs here and here, as well as taken a deep dive on how to find the best KPIs for your organization. If you haven’t read those posts already, I encourage you to go back and visit them now. With your KPIs in mind, you can determine the types of dashboards you need. This decision is based largely on who will view the dashboard, when it will be viewed, and how the data will be used (which, as you recall, I covered in detail above). With your KPIs in mind, keep drilling down to the specifics. What metrics do you need to track to understand how you’re progressing? What real-time data can you track to see what your visitors are doing right this second in relation to your overall goals? What data do you need to make growth-driven decisions for your organization? As you start outlining the metrics, facts, and figures you want to track, you’ll start to see how different functions require slightly different dashboards. This will help you get started in creating the right dashboards for your organization. Before we go on, it’s important to note that you should probably have several dashboards for your organization—one that outlines your overall marketing performance and several others that drill down into the nitty gritty based on each tactic you’re using to grow your business. Here are some of the most popular dashboards and how they’re typically set up to get your growth mindset in motion. 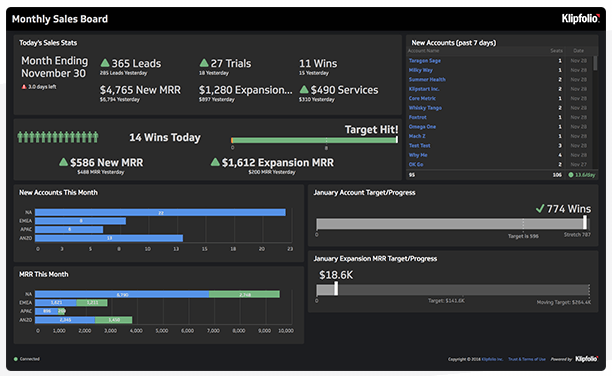 This dashboard is one of the must-haves for any organization. It gives you a bird’s eye view and an in-depth look simultaneously at what’s working in your marketing initiatives. 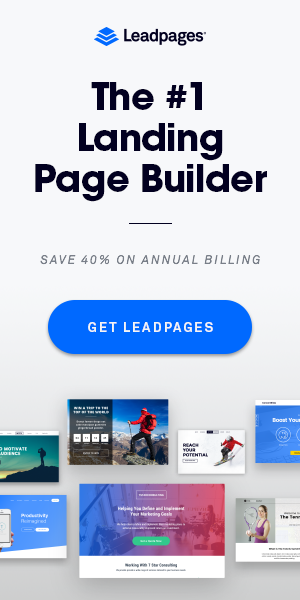 Set it up to view your various conversion channels, so you can make better decisions about where to invest your budgets and where you need to make adjustments. Digital channels are perhaps the easiest to track because there is so much data attached to them. 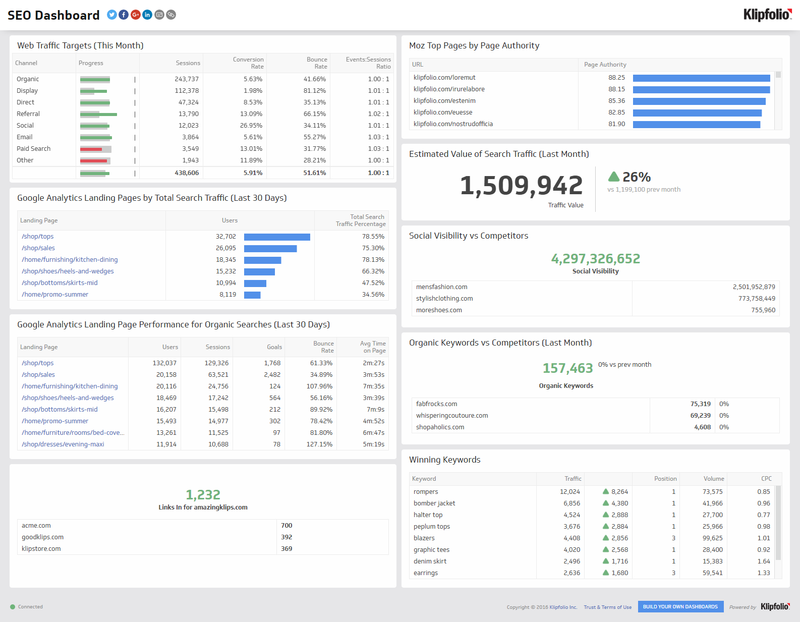 That amount of data can make the level of information flowing your way feel more overwhelming than it needs to be, so on this dashboard, focus on only pulling out the key metrics for each individual channel. These metrics include lead generation strategies, social media, PPC, website traffic, and your email campaigns. If you sell anything via your website, you need to track your campaigns and conversions. 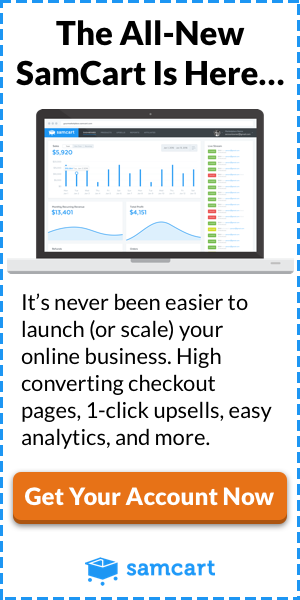 This marketing dashboard will give you a glimpse into which ecommerce channels are driving the most traffic and the most sales (often times those two aren’t mutually exclusive). Where do you rank for your top keywords? Which keywords bring in the most traffic? Which keywords have the best conversion rates? Remember that traffic and conversions aren’t mutually exclusive. The search engine marketing dashboard should give you both. And it should tell you where you can’t afford to see a drop in rankings. When you’re meeting with the executives in your organization, or you need a high-level overview to share at your monthly board meeting, this is the type of dashboard to use. It can tell you your cash balance, customer satisfaction (which offers some insight into overall CX), the performance of your sales representatives, profitability, and your growth rate (my favorite metric to track). If you have a sales team, you’ll need to regularly track where you are in terms of your sales goals and which reps are getting you closer to your growth goals. You’ll also want to see win/loss reports, how many new customers you’ve acquired, and more. 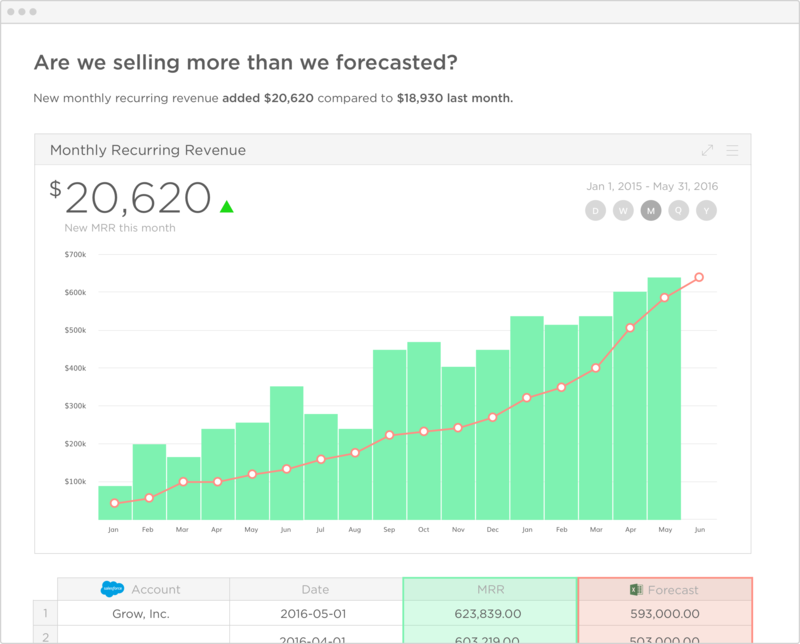 The sales dashboard is a great place to get all of that information at a quick glance. Open rates, click-through rates, funnels, oh my! Those are the basic email marketing metrics, but then you should also track time spent in your email, how far the reader scrolled down, and how many people hit forward on your email. Yes, there are a lot of email marketing statistics, but unless you’re regularly browsing through them, you won’t know what’s really working and what isn’t. Put it all in your email marketing dashboard and it’ll come together, enabling you to send smarter better emails. Social media is a world in and of itself. It’s easy to get sucked into the glitz and glamour of likes, fans, and followers, but those are just vanity metrics. As I said above, you need the sanity metrics, especially when it comes to tracking your social media marketing. Dig deeper and set your social media marketing dashboard to track which posts drive the most engagement, how each social media relationship has impacted your bottom line, and where your conversions are truly coming from. No matter which dashboards you implement in your organization, remember this: Their purpose is to track meaningful data points in an effort to gain deeper insights, such as how to improve the customer experience, boost customer usage, or build loyalty. The end goal isn’t to give you a quick glance at your stats so you can check that item off your to-do list. These are the tools you need to propel your growth forward in all facets of your business. Now don’t get me wrong here. Too much data isn’t a good thing either. It’s critical that you track the right data. Follow the K.I.S.S. principle (keep it simple, silly). If you try to cram too many statistics (particularly those that don’t *really* matter to getting you closer to your North Star metric), you’ll drown in facts and figures and fail to grow. What information do you need to make a split-second decision about what’s working and what isn’t? That’s the information you need to track. You need to have a dashboard that, at a quick glance, will tell you which channels or campaigns are bringing you the most conversions. How effectively are you growing toward your large and small goals, objectives, and KPIs? This should be easy to see at a quick glance too. Put the key metrics that’ll give you these answers quickly and accurately. I’ve talked quite a bit about what to put on your dashboards, so now it’s time to put these ideas into motion for your business. The first step: Finding the right marketing dashboard technology for your organization’s needs. There’s no shortage of marketing dashboard technologies out there. Each one offers something slightly different. Each one caters to a different size business or structure. So, finding the right one can feel like a J-O-B, but it doesn’t have to. I’m here to save you hours of trials and research. Check out some of my favorite marketing dashboards below and find the one that best aligns with your organization’s goals. Enterprises are a little more complex than the average business. There are several moving parts, several moving campaigns, and several tracks to conversion. If you’re a large enterprise, you have more people involved in your marketing team, which means you also have more data you need to present to each person or team. To do so effectively, I recommend the following four tools. Domo is a cloud-based marketing dashboard that lets executives connect with one another, prepare, visualize, engage, and optimize their business using data. There is a native mobile app, making it easy for companies that travel a lot to still keep a pulse on what’s happening in their organization from anywhere in the world. That’s probably what I like about it the best: the built-in flexibility. One of the ways this tool is so flexible is that it lets different users see different data. Remember when I talked about the importance of catering your dashboards to your internal audience? This tool answers that in force. Hand it over to the decision-makers in your organization and let them decide what data they need to access and understand, freeing you up to do your work most effectively. Domo gives you an edge in your industry by making you a little (or a lot, depending on how you use it) more competitive. By analyzing your funnels and assessing your customer experiences in real time, you’ll have the information you need to make smarter, better decisions. There’s a free trial of Domo. After that, the fee depends on a variety of factors. Contact their sales department to learn more. Tableau makes data digestible. It turns numbers into action items, which enables your firm to quickly reveal hidden opportunities. I like the setup of this dashboard a lot. Not only does it have a cloud-based and mobile version, but you can also install it on your desktop – Mac or PC. Once you’ve created your account, you can drag and drop interactive dashboards to give you advanced visual analytics. Find something intriguing? You can easily share it with someone else in your firm. Tableau can integrate big data, external maps, and other types of advanced metrics without excessively difficult implementation. Once implemented, you can use it to visualize your sales data, watch how effective your customer support team is at resolving customer issues, and break down market regions. Per-user pricing starts at $35 per month for the personal edition or on-premises/public cloud versions and goes up to $70 for the professional edition. Special enterprise licensing is available upon request. Looker is an excellent tool when you need to dig into granular data. Every team member has the ability to analyze their own data without the need for contracting the data analyst on your team to run queries for them. For example, the product development team will want to (and can) dig into different data than the operations team, and it’s all possible with this dashboard.This tool is ideal for cloud-oriented teams or teams who aren’t always near the office to check data. That means on-the-go sales teams can still access data, regardless of location. Or, if you have developers abroad, you can still give them the tools they need to make better decisions without worry about geography. Everyone on your team stays informed in real time. Looker is another piece of software that doesn’t make the price super clear up front. Contact the sales team for a quote and demo. Sisense is an excellent tool for simplifying complex data. It gathers data from multiple data sources and brings it all together in a visually-appealing package. It’s a powerful tool but it’s also easy to use, which makes it a win in my book. One of the reasons I’m drawn to Sisense is that it’s easy to gather data quickly without the help of an IT department. This eliminates excuses for not tracking data, making your team more likely to log in and take notice of what’s going on in your firm. Many organizations use this one tool to replace several products and services, which is another reason why I am a big fan of it. It saves time and energy by consolidating such robust material into visually appealing reports. In other words, you spend more of your time analyzing than you do gathering. Like most of the other tools, you must request a quote for pricing. Most SMBs I’ve worked with are looking for something they can quickly and easily implement. They don’t have a lot of time, which means they need an out-of-the-box solution that’s up and running in minutes instead of days. To answer this need, here are four business intelligence tools I love for SMBs. 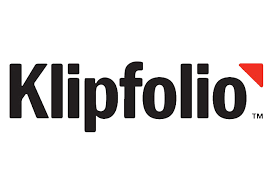 Klipfolio is perhaps one of the most popular marketing dashboard tools among SMBs, so it deserves a spot on this list. It’s another cloud-based app designed to let you build and share real-time dashboards. One of the perks that I enjoy is its ability to connect to several data sources, including Moz and Salesforce. There’s no need for a middle SQL-based database to get your most important data into your reporting system. The support with Klipfolio is bar-none. There are templates you can use to get started in the world of marketing dashboards with ease, or you can watch videos while doing the associated exercises to custom-build one for your organization. Plans start at $24 per month, making it ideal for an SMB budget. Like Klipfolio, Dashthis connects a variety of digital marketing tools, feeding them into one reporting dashboard. Once created, you can share these dashboards with others inside or outside of your organization. 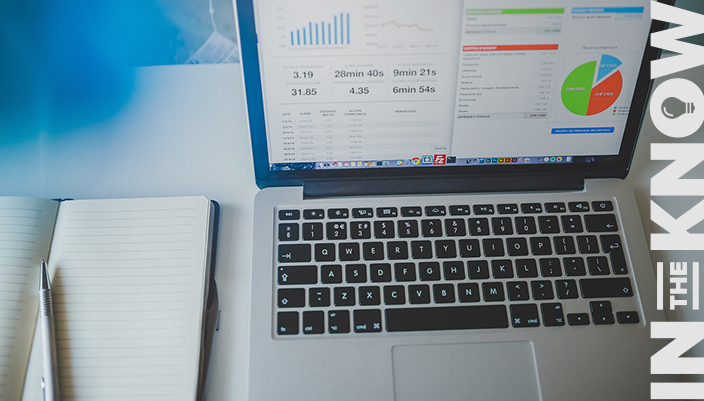 That last part is important because it poses a tremendous opportunity for many businesses – particularly those with clients who want to see marketing reports. Dashthis doesn’t just offer the opportunity to white label their reports with your logo by creating custom designs – they encourage it. Each widget can be personalized to show the data you want, how you want. Then, you can create email lists and automate your report distribution. It takes a big load off the plate of any SMB who is strapped for manpower and wants to leave more work up to the robots. Pricing starts at $39 per month for up to three dashboards. For the agency model, like I described above, they urge you to go with the $399 per month for 50 dashboards. All plans come with a free 15-day trial. 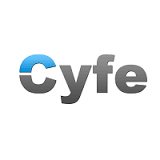 Cyfe has caught the eye of many SMBs because it’s just so gosh darn easy to use. Sign up, connect a few of your marketing tools, like Google Analytics, social media, and your CRM, and within an hour you have a beautiful dashboard that updates in real time. Cyfe is really good at helping you monitor all of your various marketing channels without feeling overwhelmed. It simplifies all of the data into a dashboard that’s easy to glance at and get answers – exactly what a marketing dashboard should do. The big downside? It’s still not able to integrate with several of the premier marketing automation systems, such as Marketo and Pardot, but I’m sure that’s in the works. There also aren’t quite as many widgets as I’d like to see to make it even easier to use for SMBs, but again, I’m sure those are on their way (right, Cyfe?). There is a free version of this software, so sign up and tinker around with it to see if it’s right for you. The premium version gives you an unlimited number of dashboards for only $19 per month (or $14 per month if you pay annually), and that includes the ability to customize and share your dashboards. Grow gives you a dashboard that connects to numerous data sources from around the web, including HubSpot, Google, and Salesforce. It’s an excellent tool for getting accurate sales forecasts and finding data trends, so you could say it’s an excellent tool for getting a glimpse into the future of your business. Once you’re all set up and have learned the system, it’s easy to use and easy to analyze. The trouble is getting it set up. Many people I’ve heard from have invested a good chunk of time to get up and running, but not without the one-on-one support of the Grow team, which is why it’s worthy of this list. Plan on working closely with their support department because there is some coding involved (they’ll do it for you). Grow requires you to reach out for a quote since as they say on their website, they serve companies from 2 to 20,000. It doesn’t take long to hear back, so it’s worth checking out to see what kind of pricing you can get for your SMB. The tools have been laid out for you. The design has been pretty much laid out for you. Now, it’s up to you to pull together a custom solution to visually display your business’s most important data. By setting up a marketing dashboard, you align your entire team so that everyone is working toward a common goal. Marketing dashboards strip away human instinct, making it easier to make data-driven decisions across all departments. You’ll stop working out of silos and start investing your revenues into the channels and areas that’ll enable you to continue growing your profits. It’s time to get to trackin’! I’d love to hear which metrics you’re monitoring your new or redesigned dashboard. Sound off in the comments below and help inspire others to improve their data visualization techniques. We’ve got you covered! Here are three learning paths you can take now, for free, to expand your skill set in this area.